Prayer begins each morning, thanking God for all He has given us, talking to Him about our loved ones, giving Him our worries, knowing He is with us. Our kindergarteners develop an understanding of right and wrong and that respecting others helps the classroom community to run smoothly. We learn to share materials, manipulatives, and attention by acquiring skills to be able to do this without being bossy or rude. We recognize that there are productive ways to express ourselves and that what we say and do affects other people and plays a key role in making friends. Mastering this skill is an ongoing process and five-year-olds are just learning it. We work on being consistently able to share and be polite. We learn to problem solve and make age-appropriate decisions, to explore new things and to take some safe risks. We focus on treating others as we would like to be treated. Our kindergarten is an academically rigorous environment in which reading skills blossom and mathematical minds are challenged. 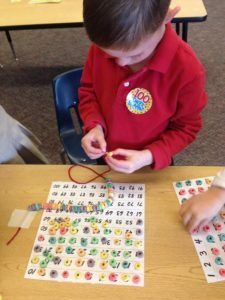 In addition to learning the alphabet and the sounds of the letters, children learn to decode words, recognize sight words, and write down ideas. We teach basic math skills, including numeral and number recognition, sorting, and patterning. Understand concepts of print (examples: parts of a book, left to right, top to bottom). Can distinguish differences in sounds of spoken language. Understand that a letter represents a sound. Know some words by sight ( the goal of 25). Listen to and demonstrate an understanding of a wide variety of text (examples: alphabet books, informational stories, literature and nursery rhymes). Correctly answer questions about a book read aloud. Connect events in a story to life experiences. With approximate accuracy, write upper and lower case letters of the alphabet. Use letter-sound knowledge to write independently. Spell some simple words correctly. Write simple messages or directions for a specific reason. Write a brief story (beginning, middle, end) with illustrations that match the text. Able to write his or her name and some common words. Write using beginning letter sounds. Able to express ideas on paper through drawing and beginning writing. Understand and follow simple oral directions. Show and tell using props. Tell about an experience or story using a logical sequence. Share information in complete, coherent sentences. Use role playing to better understand situations. (examples: books, magazines, newspapers, TV websites, radio, videos, CD’s, etc.). Name and act out things God has made. Share favorite things which God has made. Retell Scripture stories in own words, drawings or in role-playing. Demonstrate an understanding of religious vocabulary. Participate in frequent prayer experiences. Participate in service opportunities appropriate to age. Know and participate in liturgical season activities and celebrations. Responds orally to a variety of questions. Identify and differentiate money, penny, nickel, and dime. Count to 100 using objects. Identify “more or less” from pictographs and bar graphs. Sort, classify and order objects by size, color, shape or other properties. Create and extend patterns using concrete models. Understand more than, equal to or less than. Identify measurements of length, weight, and size. Understand concept related to the time of day. Identify plane and solid figures. Describe size and color of objects. Recognize the pattern of a cycle. Understand that living things are everywhere. Recognize that change happens to many things. Identify the sun, moon, stars, and Earth. Understand that things can be reused or recycled and the impact it has on the environment. Raise questions about the world. Describe or draw simple observations. Describe data from a chart. Observe changes in the world. Know the difference between a statement and a question. Recognize the food guide pyramid as the basis for healthful eating. Demonstrate good personal health habits. Name behaviors that help prevent the spread of infection. Identify how others influence health choices. Locate school and community health helpers. Identify positive ways to respond to conflict. Understand the need for rules, leaders, and authority. Demonstrate the necessity of rights and responsibility of self (examples: taking turns, chores, care of personal belongings, respecting what belongs to others, following rules, practicing honesty, self-control, and kindness to others). Use voting for group decision-making. Say the Pledge of Allegiance and discuss how the pledge is a promise to be loyal to the United States. Understand how people work at jobs to provide for basic needs and wants. Understand how limited resources force choices. Introduce good decision making with money. Know that the globe is a model of the Earth. Use terms to describe the relative location (examples: near, far, up, down, left, right). Introduce directional terms-north, south, east, west. Use maps and mapping skills and locate places on maps. Learn basic global features (examples: oceans, continents, poles, axis). Distinguish among past, present, and future. Identify the importance of holidays and celebrations. Formulate questions to obtain answers about a specific topic of interest. Explore ways that music can reflect different cultures. Explore different materials, tools, and techniques and begin to create art. Begin to create art using different materials, tools, and techniques to communicate ideas, experiences, and stories. Observe and discusses art works. Begin to identify what they see and feel about the work of art. Identify and perform a variety of developmental movement patterns (examples: running, jumping, throwing). Enjoy and participate in a variety of physical activities. Mrs. Colleen Petersen has a Bachelor's degree in Elementary Education and Art from Oregon State University. Before moving to Bend, she taught kindergarten in Hawaii and taught in the Portland area schools. She has taught for over 17 years at St. Francis of Assisi Catholic School. 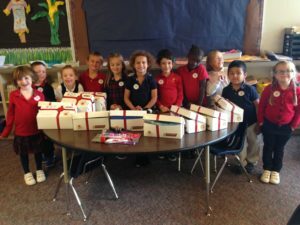 She began teaching at St. Francis when the school was in the downtown location and has experience in grades Kindergarten through third grade and PE. 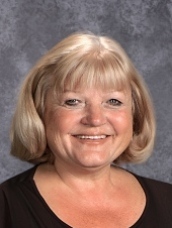 Mrs. Petersen has been in Bend for 35 years and has three children who have graduated from St. Francis School. 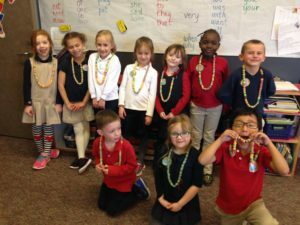 Mrs. Petersen is trained in Storyline and her class looks forward to various themes, often culminating in a kindergarten store to enrich and enjoy what they have learned. She enjoys fun and different methods of teaching math and has participated in several Creative Mathematics classes, involving learning to music, rhythms, rhymes, etc. She completed the 3-year ONREP (Oregon Natural Resources Education Program) and enjoys bringing outdoor science education to the curriculum, and emphasizing caring for our world. Mrs. Petersen strives to help every student achieve success. She believes in teaching the skills and strategies to become independent, yet disciplined, creative thinkers. She focuses on the social/emotional development of the child, and learning to become kind, considerate and responsible citizens, treating others as Jesus would like us to do. She enjoys spending time with her family, being outdoors, and going to new places.